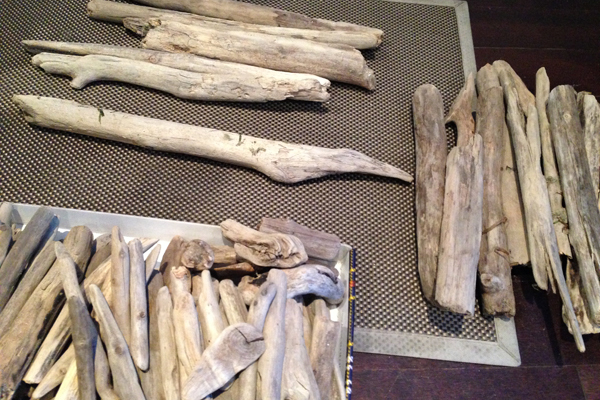 The beach is my playground in so many ways and I am really into driftwood creations these days. Look also at recent creations featured on the Motherboards by Jan Ferguson; driftwood coffee table and driftwood coat hanger. The wreath is close to my heart because it makes me think of our beach cottage during the winter time when we are not able to enjoy that magical place. It is a little bit of the summer awesomeness hanging on my city wall, year-round. 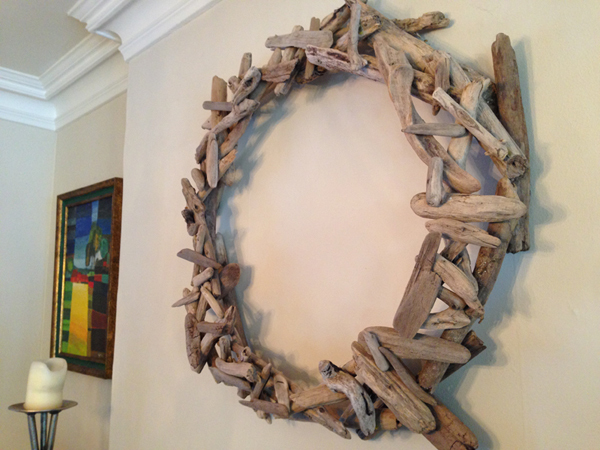 Comb the shores of any beach for driftwood. Yes, people in Toronto, go to Lake Ontario and grab those treasures (dry at fireplace or on top of central air vents). 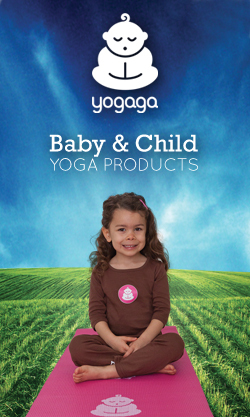 Doing this with your kids makes it even more fun. 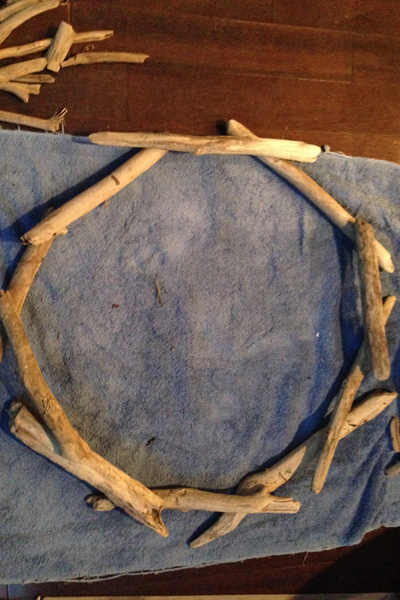 I created a rough circle shape using the largest and strongest pieces of wood overlapped at the corners. 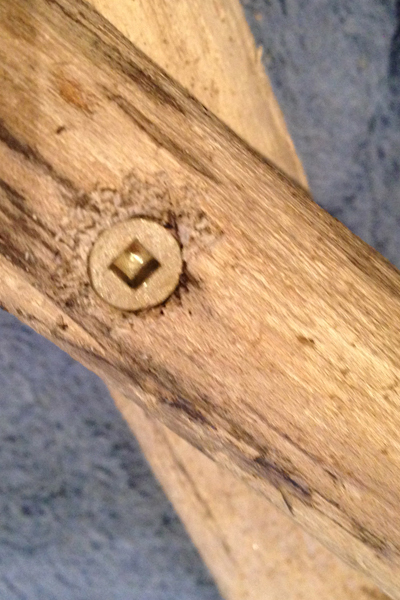 I then attached those pieces together with screws. I decided to pre-drill the holes as it is just easier to keep the shape of the circle and avoid any wood splitting (some of the wood will act unpredictably) by predrilling. I used wood tones screws that I happened to have already in my tool room. When you have your “circle” screwed together, add more pieces of wood in random matter overlapping the first layer and creating a stronger structure by each piece you attach. I kept using the drill and screws. 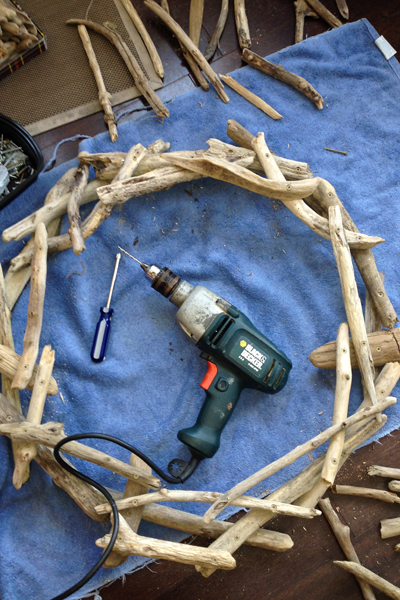 I then proceeded adding a lot of small pieces of driftwood and attached those using carpenters heavy duty wood glue (got it at Home Depot). 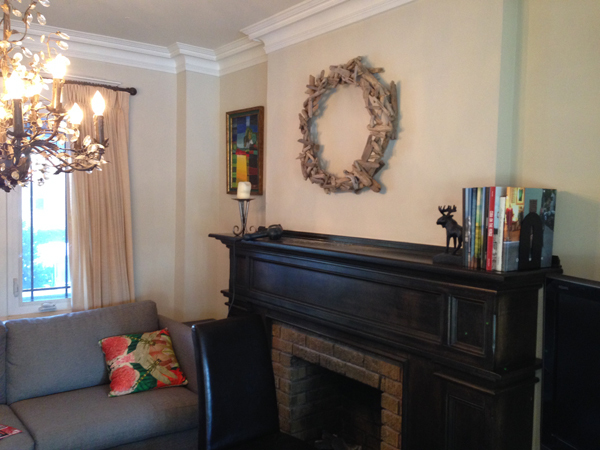 Attach strong picture hooks on the back and hang. Voila. I am probably going to keep this up year round and will add some elements for Xmas, making it a bit more festive – perhaps inserting some bunches of red berries. Or just a great string of lights. That’s fantastic! Pretty and rustic and dare I say, cheap?